Is the bicycle, like the loudspeaker, a medium of communication in India? Do Indian children need trade unions as much as they need schools? What would you do with a mobile phone if all your friends were playing tag in the rain or watching Indian Idol? Children and Media in India illuminates the experiences, practices and contexts in which children and young people in diverse locations across India encounter, make, or make meaning from media in the course of their everyday lives. From textbooks, television, film and comics to mobile phones and digital games, this book examines the media available to different socioeconomic groups of children in India and their articulation with everyday cultures and routines. 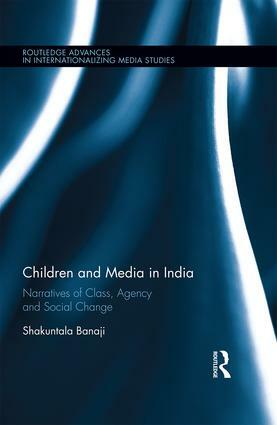 An authoritative overview of theories and discussions about childhood, agency, social class, caste and gender in India is followed by an analysis of films and television representations of childhood informed by qualitative interview data collected between 2005 and 2015 in urban, small-town and rural contexts with children aged nine to 17. The analysis uncovers and challenges widely held assumptions about the relationships among factors including sociocultural location, media content and technologies, and children’s labour and agency. The analysis casts doubt on undifferentiated claims about how new technologies ‘affect’, ‘endanger’ and/or ‘empower’, pointing instead to the importance of social class – and caste – in mediating relationships among children, young people and the poor. The analysis of children’s narratives of daily work, education, caring and leisure supports the conclusion that, although unrecognised and underrepresented, subaltern children’s agency and resourceful conservation makes a significant contribution to economic, interpretive and social reproduction in India. Shakuntala Banaji is Associate Professor of Media and Communications and Programme Director for the Master’s in Media, Communication and Development at the London School of Economics, and member of IAMCR through the institutional membership of the Department of Media and Communications, LSE, UK.